Happy National Coffee Day! A lot of bloggers are celebrating this amazing holiday by participating in the Coffee Lovers' Bloghop, hosted by Chaitali and Amy! Simply create a coffee themed project and link it up at Chaitali's blog here. Before I share my coffee card, I wanted to share my special coffee shop layout. This has only been posted on my Instagram (rwkrafts) and is from our anniversary trip to the Catskills over the summer. This super funky coffee shop called Mama's Boy became our morning (and afternoon) pit stop each day we were there. 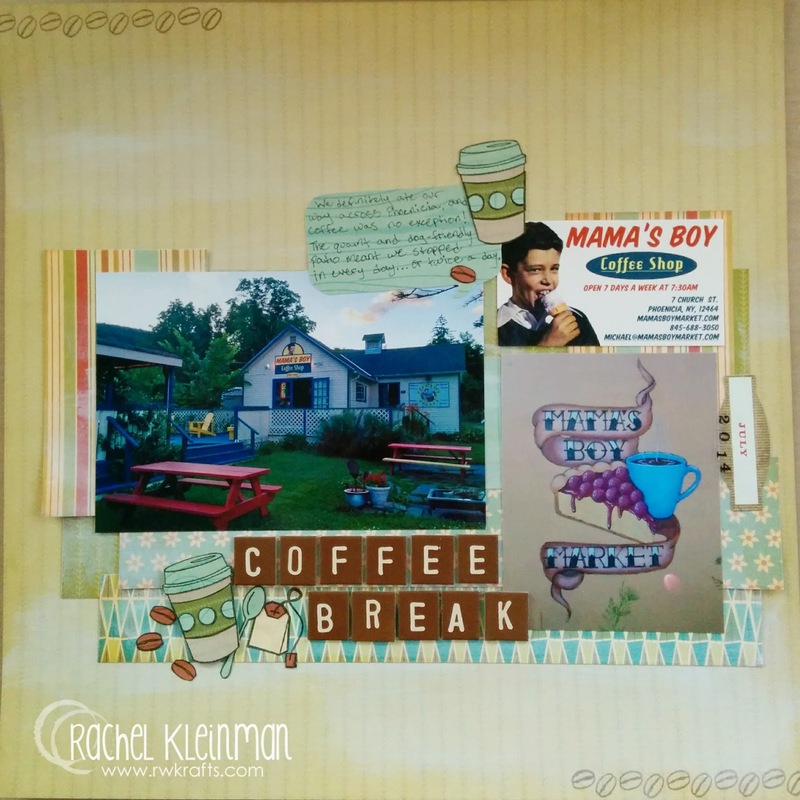 The coffee mug, tea bag, and beans were all paper pieced and added to my layout. Paper is from Cosmo Cricket. I've had this sweet Penny Black stamp set for almost a year, but just haven't inked it up yet! Mimi in Paris has the cutest little cafe stamp, so here she is for my hop project! I colored Mimi in traditional French colors with my Copic markers. I added the sentiment from a very old Fiskars coffee stamp set. With the exception of the very tiny red rhinestones, this is a One Layer card! 1) When did you start drinking coffee? 2) What is your favorite brand? - I love my Starbucks, but also love some of our local coffee shops (Blue State in New Haven is fantastic!). I also love my Target brand k-cups! 3) What is the most amazing coffee you've had? - Another local shop called Willoughby's once had a seasonal drink called the Mexican Mocha. It was espressoy, chocolatey, and spicy... and it was oh so yummy. Thank you to all the wonderful coordinators of this fun hop! Enjoy your coffee today! okay, I'm so glad that you shared that awesome layout...it's soooo fabulous! Love all the fabulous details. Your Penny Black card is ADORABLE. She totally makes me smile! 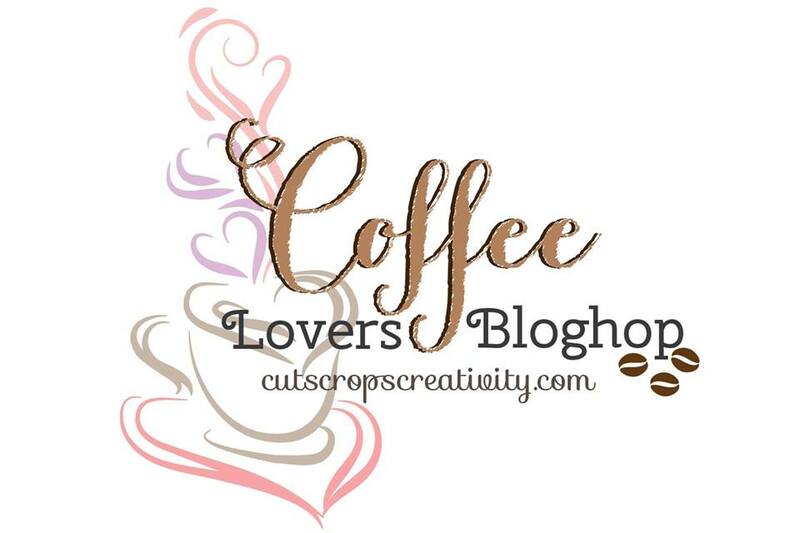 Thanks for joining us for the Coffee Lovers Blog Hop and Happy National Coffee Day! Awesome, LOVE the layout, and the sweet girl Rachel!!!! What a fun layout! And your card is ADORABLE!!! Love! Oh my goodness! Adorable projects! Love that you incorporated the business card in your layout. Really fab! Ohh, look how happy Mimi is in Paris! Just lovely, and the layout is so fun. Love the layout - and what a cool name for a coffee shop! I forgot about this Penny Black set, so thanks for sharing such a cute card on this special day. How fun is that layout Rachel?! Love the little girl colored up so cute too! This page is so fun and love your Mimi card! Uber cute! Such cute projects! And love, love your layout! Rachel, this is just adorable. Love the little red rhinestones. Love your layout and your card is just precious!! Great layout and super cute card! Love your layout and your card!! Love the layout and that adorable little card!! Yay! Such a great layout. Love the cute card too! Love that cool layout and the super cute card! Great projectss! Love that little girl stamp! So much great inspiration on the Coffee Lovers hop! Super cute projects! Gotta love National Coffee Day! So cute! I love Penny Black images! I want to go to that coffee shop! That looks like such a cute & sweet lil coffee shop! Great layout and awesome card!! Great layout and card - love the subject matter LOL! !